UbuntuNet-Connect 2015, to be held in Maputo, Mozambique, on 19-20 November 2015 will not be a usual conference characterized by the presentation of papers and the routine activities associated with the annual conference. This is a special conference which will mark the Alliance’s 10th Anniversary and the anniversary cannot come and go without mentioning the people that gave birth to the UbuntuNet Alliance. 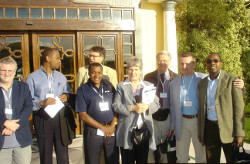 In November 2005, Margaret Ngwira, working then as a Librarian at the University of Malawi’s Kamuzu College of Nursing; Albert Nsengiyumva (then Coordinator of RwEdNet, Rwanda) Victor Kyalo (then Executive Director of KENET, Kenya); Duncan Martin (then CEO of TENET, South Africa) and Americo Muchanga (then Coordinator of MoRENet, Mozambique) with assistance from Steve Song of IDRC and Bjorn Pehrson of KTH, Sweden joined hands to form the UbuntuNet Alliance with the aim of providing high speed and affordable Internet connectivity to African NRENs to bolster research and education networking on the continent. 10 years on, the vision of these founders has turned into a reality as the Alliance, which has grown to become the continent’s leading regional Research and Education Network (RREN) has, with support from the EU, managed to build the UbuntuNet regional backbone which covers 7 countries in the UbuntuNet Alliance region effectively bring down bandwidth costs to research and education institutions in covered countries. There cannot be a better stage therefore to celebrate the turning into reality of this dream of the founders than at UbuntuNet-Connect 2015. So after hours of undivided attention to presentation of papers from authors at the UbuntuNet-Connect 2015, there will be some time to meet, honor and decorate founding members of the UbuntuNet Alliance. It is the right thing to do because without the founders, we would not not be in Maputo this November for UC 2015.